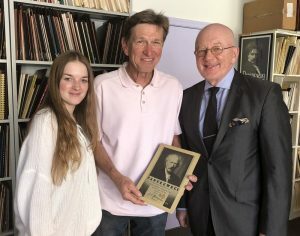 Dr. Daniel Cichy, Director and Editor-in-Chief for PWM [Polish Music Publishers] was recently in Los Angeles and stopped by the Polish Music Center to look at the manuscripts by Henryk Wars [Henry Vars] and Roman Ryterband. He also brought with him some very welcome gifts for our library, including scores of two compositions by Józef Koffler: Trio for Violin, Viola and Cello, Op. 10 and Die Liebe, a cantata for voice, clarinet, viola and cello, Op. 14. Dr. Cichy also presented us with two recent PWM book publications, Słuch absolutny [Perfect Pitch], an autobiography and letters of Roman Palester, and Si, Amore, a series of interviews with soprano Aleksandra Kurzak conducted by Aleksander Laskowski. In addition, the PMC also received from Dr. Cichy a lovely Chopin-themed mug and delicious Polish candy, “Śliwka w czekoladzie,” which we will share with all our visitors in the coming days! The happy tradition of receiving an annual gift of recordings and catalogues from the Warsaw Autumn Festival sent to us by Director Mieczysław Kominek and his staff continues! In late April, we received the Sound Chronicles of the 60th Warsaw Autumn Festival, held September 15-23, 2017. The parcel included the Festival Catalogue and a set of seven CDs featuring various Festival performances. One of these discs is dedicated exclusively to works by young composers, presented a two Youth Circle Concerts organized during the Festival by the Polish Composers’ Union. As in years past, this gift will join our large media collection and likely become one of the most used items in our library. The gifts from POLMIC also included a recent DUX recording, “In the Circle of Andrzej Nikodemowicz” (DUX 1450). Born into a Polish-Armenian-Ukrainian family in Lwów in 1925, Nikodemowicz studied there with Tadeusz Majerski, then moved to Lublin in 1980. Nikodemowicz died in January 2017 in Lublin and the DUX CD features his 19 Expressions for Piano (1960), as well as Majerski’s Piano Suite (1953) and 24 Mini-Preludes for Piano (1993) by Mariusz Dubaj, who was one of Nikodemowicz’s students. The pianist for this rare and excellent recording is Marek Drewnowski. Last month, the PMC’s Ryterband Collection grew by addition of several new and important documents, donated by Diana Eisele on behalf of her mother, Clarissa Ryterband. These documents shed light on the efforts of Roman Ryterband and later his widow Clarissa to mount performances and organize deposits of compositions and their publication with such companies as Alpheus Music Corporation, ASCAP, Hug & Co. Musik Verlag, Lyra Music Company, Music Graphics Press, PWM Editions, the Agua Caliente Cultural Museum, and San Diego State University. Another item donated to us by the composer’s family is an LP recording produced by the CKVL Radio station in Montreal, Quebec, where Roman Ryterband served as music director in the late 1950s. This LP features performances of Roman Ryterband’s Piano Sonata, Pièce sans titre, Triptyque Contemporain and Capriccio gavottuoso. 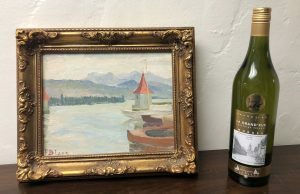 Dr. Wojciech Kocyan, Clinical Professor of Piano and Artist-in-Residence at Loyola Marymount University in Los Angeles, presented us recently with a 2013 vintage bottle of La Grand’ Rue – Chasselas Réserve, a white wine produced in Morges, Switzerland. This charming and historic town on the shores of Lac Leman, just outside Lausanne, was the primary home of Paderewski during the years 1899-1940. On the grounds of his ca. 100-acre estate, Riond-Bosson, Paderewski had extensive greenhouses and produced grapes that were famous throughout Europe. He sent them as gifts to his friends in high places, including royalty, political and spiritual leaders. This bottle joins our Paderewski Collection that, among other fascinating items, also has wines produced on former Paderewski’s ranches in Paso Robles on California’s Central Coast. 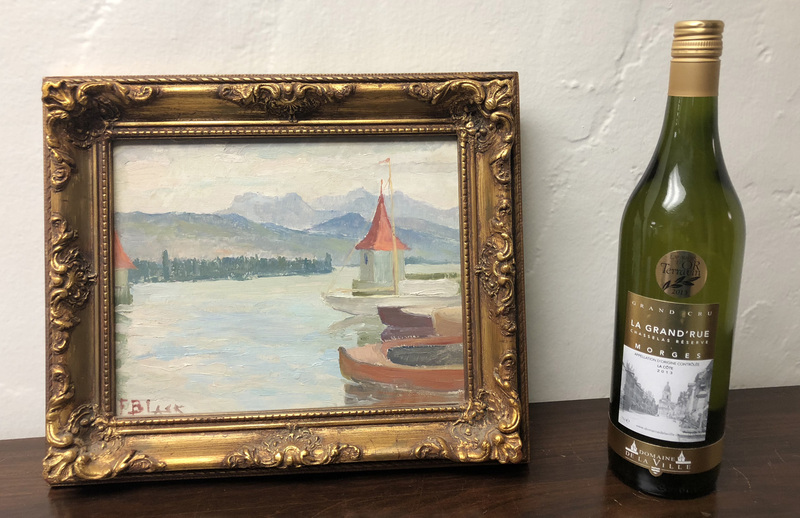 It also fits quite well with the original oil painting in our collection that came from Paderewski’s villa, Riond-Bosson, showing the characteristic lighthouse structures at the entry to the Morges harbor that are also featured on the wine’s label. Mr. Jan Niebrzydowski from New Britain, CT, recently sent us some fascinating materials relating to Ignacy Jan Paderewski and his wife, Helena. A long-time, dedicated collector of correspondence, documents and stamps relating to Polish history, Mr. Niebrzydowski sent us original stamps issued by the Polish Post, portraying Helena Paderewska in her White Cross uniform and Father Lucjan Bójnowski, whose parish in New Britain supported Paderewski’s fundraising efforts in the US during World War I. Also included were two envelopes with Madame Paderewska and Father Bójnowski stamps, bearing special Polish Post marks commemorating first day of circulation. In addition to stamps and envelopes, Mr. Niebrzydowski also enclosed a number of copies of documents in his possession, including various donation receipts for Polish White Cross, correspondence from the Haller Army Veterans and Polish Catholic Church hierarchy with Fr. Bójnowski, and a copy of a letter from Helena Paderewska to one of the Haller Army nurses in Chicago. Other copies included correspondence addressed to Paderewski in Switzerland as well as postcards addressed to Helena Liibke and written by Polish military personnel interned in various POW camps during World War II. Also from Mr. Niebrzydowski we received an original postcard from Roman Jasiński, who was a one-time fiancé to Ms. Helena Liibke. This rare document, dated 28 December 1944, announces Mr. Jasiński’s arrival in Lausanne on January 5, 1945. Andrew Kozłowski, a longtime supporter of the PMC, stopped by our offices on May 10 with his daughter, Julia, who is a USC student. They brought a very special gift for our collection of Paderewski-related memorabilia: a program booklet of Paderewski’s last appearance in Los Angeles that took place on April 2, 1939 at the Shrine Auditorium, located just across the street from the USC campus. This program booklet was originally given to Mr. Kozłowski and the Polish Center in Los Angeles by Lark Ireland from Atascadero, California, a location not too far from Paderewski’s one-time ranches in nearby Paso Robles. Thanks for this important gift and—if there’s anyone out there in the world who has some more Paderewski-related memorabilia—please get in touch with us! Another PMC supporter, Darek Swiatkowski who serves as Program Director for the Polish American Performing Arts Club in Santa Ana, California, gave us a CD recording, “Piosenki do mężczyzny” [Songs for a Man], featuring Agnieszka Chrzanowska. This chanteuse and poet was recently visiting the area and Director Swiatkowski secured for the PMC an autographed copy of this Luna Music PL label recording. Bay Area based soprano, Nanette McGuiness, recently sent us a CD “Jewish Music & Poetry Project—Surviving: Women’s Words” recorded by the Ensemble for These Times and released on the Centaur label. Nanette’s ensemble dedicates itself to highlighting new and old, forgotten works written to texts by Jewish women, as well as music by composers who were banned, exiled or annihilated in the Holocaust. This 2016 recording—a 2016 winner of the Global Music Awards—features music by David Garner to texts by Mascha Kaléko, Else Lasker-Schüler, Rose Auslander, and Yala Korwin.